Certain watches have sentimental value, and watch collectors find ourselves holding onto even the cheapest pieces when they have a story behind them. This Seiko SKXJ92 dates back to 1988, but my dad gave it to me in 2008. Even though it was twenty years old and never had a service, it was my first self-winding automatic timepiece and it is one piece that will never leave my collection. The Seiko SKXJ92 is a 37mm men’s automatic watch with a steel case and a gold coloured dial. The face is protected by Seiko’s usual hardlex crystal. Hardlex is supposed to be more scratch resistant than a mineral crystal, but less prone to shattering than a sapphire crystal. Stylistically, it is a clear “homage” to the Rolex Datejust – and would pass for one at wrist distance quite easily. It is powered by the workhorse Seiko 7S26 mechanical movement. It does not manually wind or hack (which means that the second hand doesn’t stop when the crown is pulled out, for more accurate time-setting). It is “low beat” which means that it ticks 6 times every second. This smooth sweep is what characterises a mechanical wristwatch and it is very pleasing to the eye! It has both a day and date display, and at the weekend you get SAT in blue and SUN in red – a feature that has led to many watch enthusiasts observing “Seiko Sunday”. Those looks! It is a relatively cheap Seiko 5 but looks far more expensive. It is regularly mistaken for a Rolex thanks to its smooth second hand and distinctive looks. Seikos are reliable watches, and this one is thirty years old this year and has never had – or needed – a service. If it breaks, replacement movements are plentiful and cheap. I love this watch. Even putting the sentiment to one side, I enjoy wearing it as it is light, accurate and pleasing to the eye. I actually choose this over my Rolex Datejust when I want to dress up! The bad news if you want one of these watches too, is that the Seiko SKXJ92 is now discontinued. 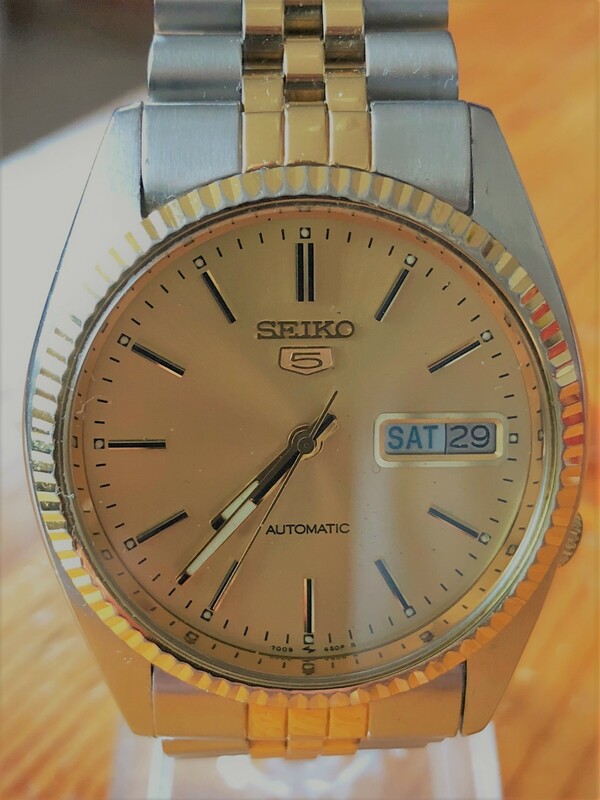 You can choose from a plethora of used Seiko 5s on eBay, and new ones at Amazon, but this particular model is hard to come by and I have seen them changing hands for £150 or more on the used market! If you see one – snap it up!